It's hard to imagine Sherlock Holmes giving up his flat. Who else but Mrs. Hudson would be willing to put up with the noise, tobacco smoke, violin music and the occasional evil nemesis dropping by? But, if it does go up for sale, someone has calculated the market price. Using this 3D blueprint plus still shots from the show…. I decided to use Sherlock's queen-sized bed as a unit of measurement, since all Queens are 60 inches, or five feet, wide. With this rather long virtual measuring stick in hand, I went from room to room and determined that the home's main floor—the one we see most often in the show—is approximately 1,756 square feet. Unfortunately, this 3D model of the home excludes Watson's upstairs bedroom, and as far as I know, so does the show. In fact, the only real mention of its existence to my knowledge is in episode one when Mrs. Hudson says "there's another bedroom upstairs if you'll be needing two bedrooms," to which Watson hurriedly replies that of course they will. And yet we never actually see this mysterious bedroom. So I had to put on my detective hat and use the powers of deduction to determine the upstairs square footage. According to the 3D blueprint, Sherlock's bedroom downstairs, the master bedroom, is just over 393 square feet and also has an adjoining bathroom, which is only accessible through his room. 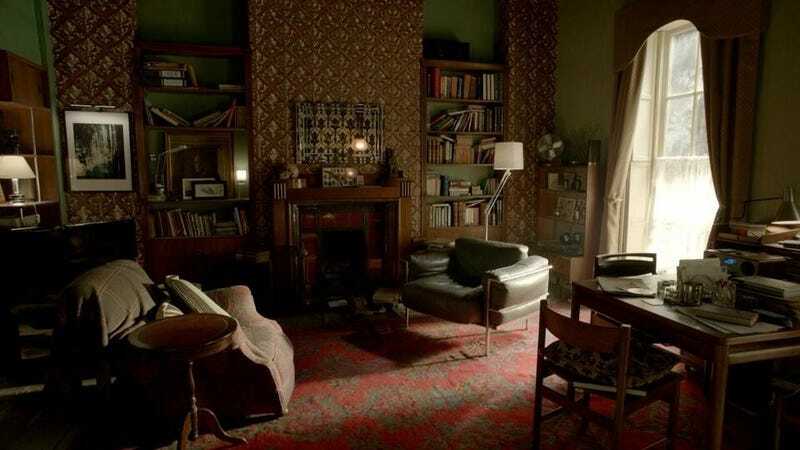 Because of this, it is safe to assume that the upstairs of their flat includes (A) Watson's bedroom (slightly smaller than the master), and (B) a bathroom (also slightly smaller than the master). That being said, I approximated the upstairs square footage to be about 380 square feet—about 300 for the bedroom and 80 for the bath. So, all told, 221B Baker Street adds up to be about 2,136 square feet. Not too shabby for a flat in the heart of London. With an average price of £963 per square foot, and a size of 1,756 square feet, 221B Baker Street would cost approximately £1,691,028, or $2,844,720, should Sherlock decide to list it—not including all of the home's artifacts, gadgets, lab equipment, human eyeballs in the microwave, or the undoubtedly huge cleaning bill you'd still need to pay if you bought the place. You can read more about how she calculated the price—and determined the actual street address in London—at the Movoto Blog.